Go all-out classic style with the Mini Me® Automatic in matt black. Small but perfectly formed, the outstanding quality of this machine really shines through, cup after cup. Its built in Play and Select feature means you can adjust the volume of your coffee to create your ideal drink without mess or fuss. With a red cable contrasting with its matt black body and its compact, easily recognisable design, the Mini Me® puts together the best of both worlds in terms of quality and style. Incorporating a maximum 15-bar pump pressure, something you might not expect to find outside your local coffee shop, you’ll get consistently high quality results whichever NESCAFÉ® Dolce Gusto® coffee pod you choose. 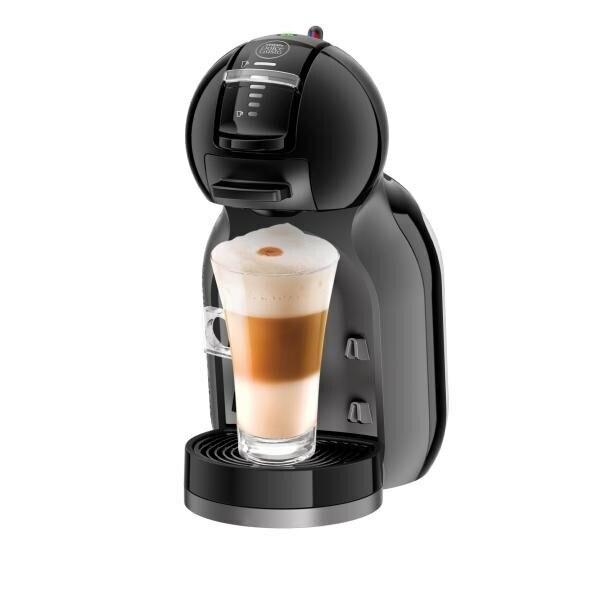 As with all our automatic coffee machines, this one is simple to clean and creates hot or chilled drinks without all the hard work and comes with a 2 year guarantee. If you want to take your coffee crafting experience to the next level, check out our range of specially designed cups and glasses – just the thing to show off your NESCAFÉ® Dolce Gusto® creations! Want to know what other machines we have to offer? Why not take a look at our full range of coffee machines. This is my second machine first was a piccolo both great machines , great coffee,but the mini me the tank not big enough to make 4 cups the only downside .it would have had 5 stars . My son who is at uni who wasn't into coffee before has my piccolo & loves it . We love the convenience of this machine so we now have a backup using the last special offers effectively one cost me about £10 using the vouchers we could use for coffee. Just remember to regularly descale it! I brought this machine last Christmas and it has been a great addition to my kitchen. It looks great, its easy and quick to use with no mess or faffing about. Great drinks range available for any time of the day. love it.